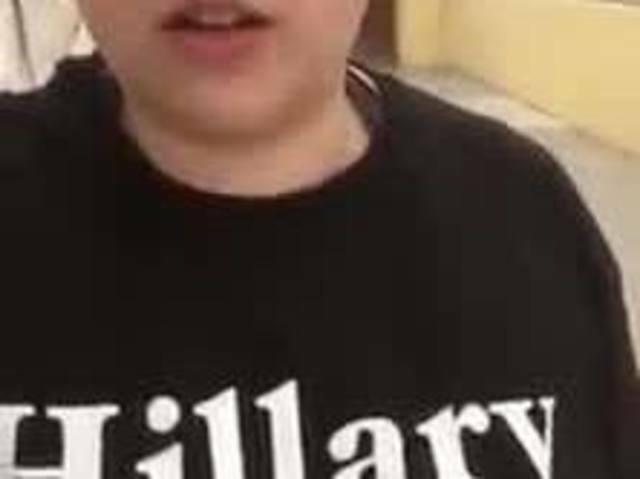 A Boca Raton (Fla.) High School student was tossed out of class and threatened with suspension for wearing a shirt that says "Hillary for Prison 2016" to school. Maxine Yeakle said she was told she did not get in trouble for wearing the shirt. Instead, she was asked to change her shirt because of the disruption it caused in class. "I am wearing a 'Hillary for Prison' t-shirt at my public school today, and in my class today some people had a problem with it," said Yeakle in a Facebook video she posted shortly after she was sent to the assistant principal's office on Tuesday. She says she was told to change her shirt or go to in school suspension for the rest of the day because her shirt caused a classroom disruption. "There was a group of girls in there who started talking really loudly and kind of obnoxiously about how awful Trump supporters are and how they are all racist and saying some really ignorant things," said Yeakle. In Boca Raton High School's handbook, there's no dress code rule that says political shirts are prohibited, but it does say that any clothes deemed potentially disruptive is not allowed. "If you get a bad reaction, then it's against the rules," said Yeakle. "It’s totally ridiculous. I just think it opens up a can of worms and who is to say I’m not offended by a Hillary shirt? And why don’t they have to change?" Yeakle says she's getting hateful comments on the Facebook video she posted about the shirt. "It is bullying because I almost deleted that video last night because I was getting so much hate and really it hurts," she said. Teachers in other local schools are seeing the elections' effects in the classroom as well. "All the gloves have come off. There's nothing sacred anymore when it comes to this campaign," said Jason Carver, a U.S. Government and U.S. History teacher at Riviera Beach Preparatory and Achievement Academy. Carver says he has had to stop class at time to explain what is 'consent' after Trump's comments about inappropriately grabbing women surfaced. "I'm all for freedom of speech and expression, but there are definitely things especially in the classroom that can be considered out of line," added Carver. Yeakle believes there was nothing wrong with her shirt. She believes the lesson administrators taught was the wrong one. "I think it teaches intolerance because those girls were intolerant of my views and my beliefs and that's teaching them that's okay because I got in trouble for that," added Yeakle. Yeakle's father picked her up from school early yesterday so she did not have to go to in school suspension. He says he is proud of her for standing up for what she believes in and will be going with her when she votes for the first time Tuesday. The school district is aware of the alleged t-shirt incident and administrators are gathering information before they respond to our request.